Perseus and the Gorgons. The Gorgons are three sisters who had hair made of living, venomous snakes, as well as a horrifying visage that turned those who beheld her to stone. Two of the Gorgons were immortal, Stheno and Euryale, their sister Medusa was not and she was slain by the demigod and hero Perseus. The Gorgon's Head, recounts the story of Perseus killing Medusa at the request of the king of the island, Polydectes. Nathaniel Hawthorne (July 4, 1804, May 19, 1864) was an American novelist, dark romantic, and short story writer. His, A Wonder-Book for Girls and Boys, first published in 1851, is a children's book in which he retells several Greek myths. 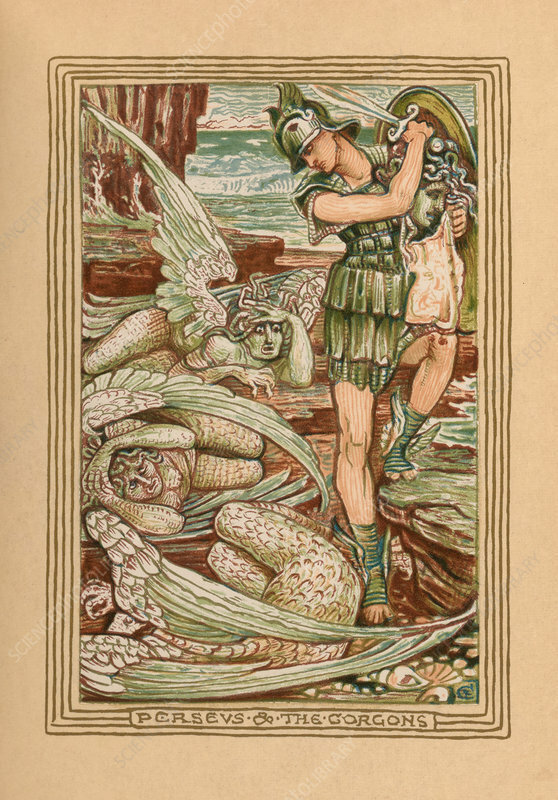 Walter Crane (August 15, 1845, March 14, 1915) was an English artist and book illustrator. Printed at the Riverside Press, 1893.